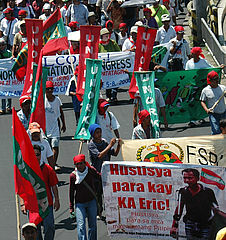 Enacted in 1988, the Philippines' National Agrarian Reform Program - Comprehensive Agrarian Reform Program (CARP) - which was later termed as Comprehensive Agrarian Reform Extension with Reforms (CARPER), aimed to distribute all agricultural lands beyond five hectares to landless farmers and farm workers. Out of the remaining balance of 1.2 Million hectares of land targeted for redistribution from 2009 until 2014, about 694,181 hectares yet need to be distributed. However, the CARP/CARPER is set to expire in June this year. This date is a crucial turning point in particular for about 206,000 hectares of land wherefore no Notice of Coverage (NOC) has been issued yet. If the concerned farmers do not receive the NOC before the expiration of CARP/CARPER, they will lose their claim for the land. Currently, the Department of Agrarian Reform (DAR) - the main responsible for implementing the CARP/CARPER - is demanding the government for the passing of a law that would allow the issuance of NOCs even after the said deadline. Today, about 400,000 farmworker beneficiaries are still waiting for the land redistribution. Throughout their decades-long struggle for the right to own and cultivate their land, they have been facing hunger, poverty, harassments, and intimidations, and some of them have even lost their lives. Their right to adequate food has been severely violated. Hacienda Matias: A recent dialogue with selected farmer-leaders, including the leader of Hacienda Matias' tenants, held last June 2014 at the Presidential Palace, President Aquino committed to fast track the decision on the Appeal of the landowner currently pending at the Office of the President (OP). Two bills - House Bill 4296 and Senate Bill 2278 - seeking to extend the Land Acquisition and Distribution (LAD) component of CARP beyond June 30, 2014 or up until June 2015/2016 have been filed at the Congress. President Aquino has certified both bills as urgent. Aquino also urged the House and the Senate to prioritize the immediate enactment of the bills. Meanwhile, the Peoples Agrarian Reform Congress (PARC) continues to mobilize to push for a substantive implementation of CARP and to bring back Agrarian Reform in the national development agenda. A unity manifesto is now being circulated for signature among the civil society groups for submission on June 30, 2014. 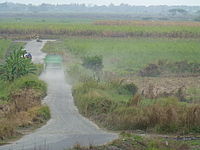 The case of Hacienda Luisita, a vast sugar cane owned by the family of the current President Benigno Simeon Cojuango Aquino III, is known to be one of the largest and most controversial landholdings to be distributed under the CARP/CARPER. The farmworkers and their families are unable to cultivate the awarded land, despite the fact that they hold land titles. Until March 2014, only 1,049 out of 6,212 farmworker beneficiaries have been installed in their lots. Moreover, without the necessary support services (i.e. irrigation systems, seeds, and tractors), the farmworker beneficiaries cannot till their land. Due to the slow implementation of the agrarian reform program, as well as the new sugar cane crops planted by the middle-men/women, the farmworkers can neither plant their choice of own crops to sustain their livelihood nor guarantee their right to food. FIAN supported the case in early 2014 with an Urgent Action. In addition to the case described above, the right to food of 500 tenant-farmers and farmer families in the coconut plantation of Hacienda Matias is also being threatened. Due to constant resistance of the landowner, a pending decision before the Office of the President on the coverage and the Department of Agrarian Reform's slow land survey process on the ground. Considering the nearing expiration of the CARP/CARPER, the tenant-farmers are in need of immediate support to fast-track the land distribution, so they can be installed on their land before the end of June 2014. In response to this situation, FIAN International launched an Urgent Action in mid-April 2014 to seek realization of the right to food of the tenant-farmers in Hacienda Matias. To learn more about the Agrarian Reform process in the Philippines, please find a list of relevant links to news articles and organizations on the subject.